FREE PHONE 0800 389 1304 FOR BEST PRICES ON IDEAL & DUPLO EQUIPMENT, PRICES SO LOW WE ARE NOT ALLOWED TO ADVERTISE THEM! 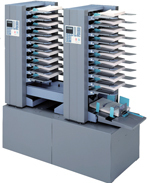 The Duplo DFC-10 is a high spec 10-station friction collator with the ability to work standalone or as part of an collating/booklet making system. It is also able to connect to another DFC-10 tower yielding a 20-station collating system or with Duplo's DBM-120 booklet maker to create 80-page booklets. For the most straightforward of jobs, just place the required number of sheets into the bins, choose the collating mode (offset or straight stacked) and away you go. A total counter will record the number of sets collated or you can input the number of sets required and the machine will count-down. 'Alternative Mode' enables the collating stations to be paired-up. This means two stations can be loaded with the same sheet so that when one is exhausted, the collator will automatically switch to the other station allowing the machine to run without stopping for maximum productivity. The empty tray can be loaded on-the-run. 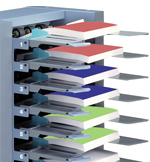 The collator's built-in stacking tray has two modes - straight or offset. In offset mode, each set is placed out-of-line with the previous set to enable the operator to easily identify and separate complete sets. In straight stack mode, the end result is a well knocked up block of sets. 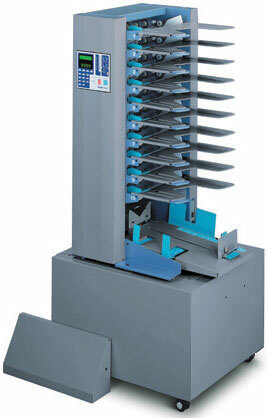 The DFC-series collators use three perpendicular rubber feed wheels to take sheets into the machine. This ensures the collators can grip all across the leading edge of the sheet to guarantee feeding of all sheet sizes from A5-A3. DFC-series collators can be connected together allowing a configuration of either 10,12,20 or 24 stations. This means that as workloads change it is possible to upgrade to a 2-tower system by simply adding another tower and not buying a whole new collating system. 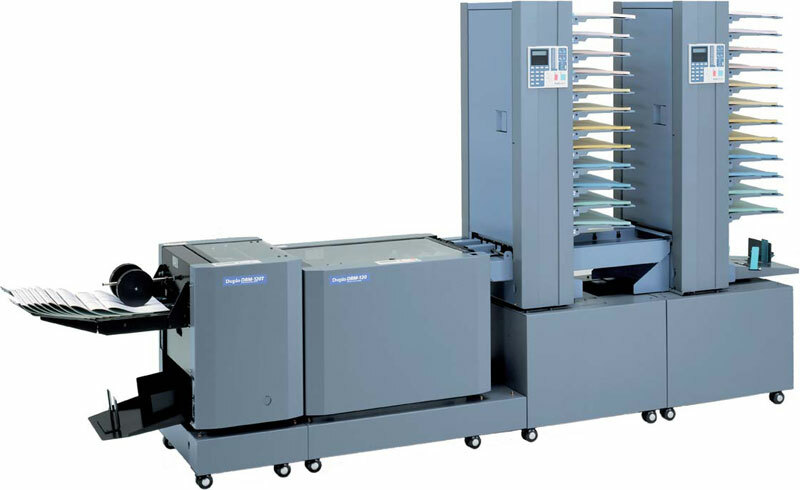 The Duplo DBM120 booket maker and DBM120T trimmer can be connected online to a range of Duplo friction collators to enabling collating and booklet making to take place on a single line. All offers are subject to availability. Prices exclude VAT and include delivery to the UK Mainland only.